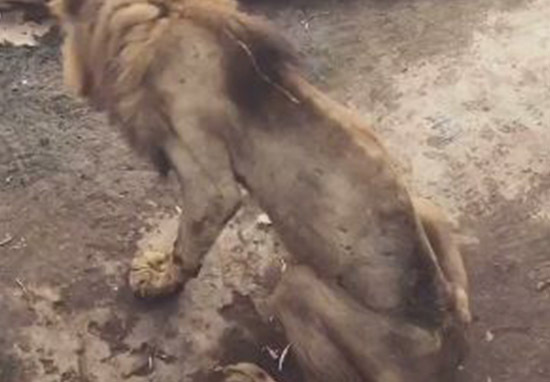 Shocking footage has surfaced, showing an incredibly emaciated lion in Comilla Zoo, Bangladesh, fighting for its life inside a dirty, small enclosure. The poor animal, named Juboraj, is in this state because of age-related complications, according to zoo officials. 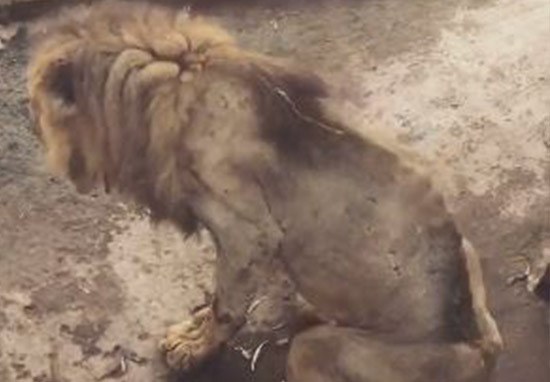 In a video, the suffering animal can be seen lying on the filthy floor, with its rib cage visible underneath its taught skin, struggling to stand up and walk. Juboraj, who is reportedly 18-years-old, is considered as being a long time past his prime. However, despite his old age, visitors have been appalled at the condition of Juboraj, with many refusing to visit the zoo. A petition has started online, calling for the President of Bangladesh, Abdul Hamid, to look into the lion’s condition – at the time of writing over 57,000 have signed in support. 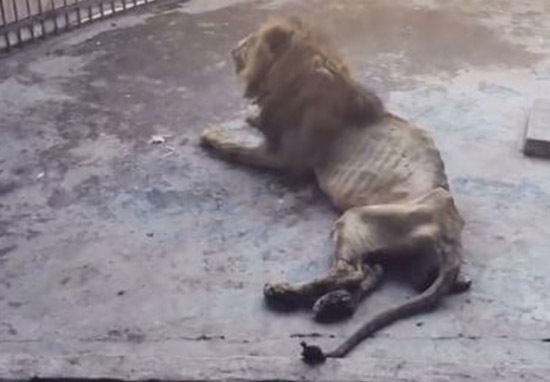 Juboraj the lion is starving to death in Comilla Zoo in Bangladesh. He spends most of his days laying down without moving and very rarely eats. They have removed him from view so that his emaciated body doesn’t upset the public anymore, but he is still in critical condition. 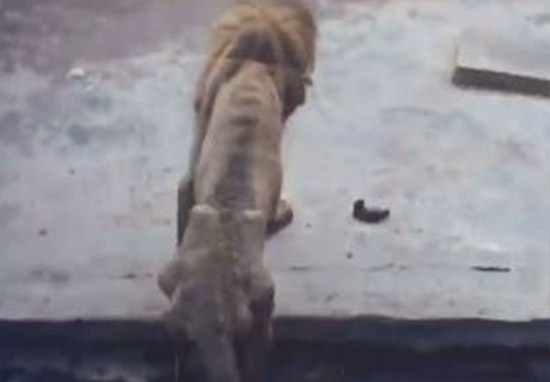 In the video, filmed from outside the enclosure, the lion’s bone structure can be made out clearly – its spine and pelvis can be seen protruding from its skin. 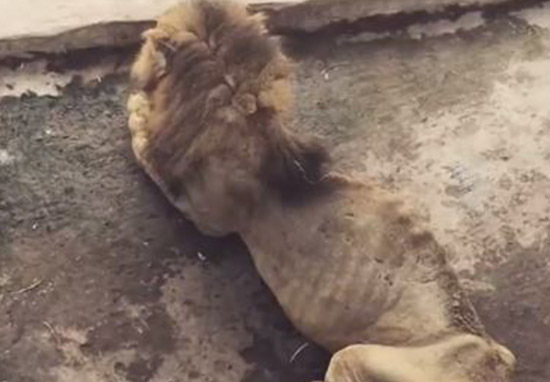 Seemingly wasting away, some have called for the lion to be euthanised, believing it to be the kindest option for an animal suffering so much. Others have said the zoo should be trying harder to feed the big cat – currently, the animal is being given its medication via darts fired from the zookeepers. Juboraj is in critical condition. We have called up veterinarians for his treatment in the near past. The veterinarians informed that a lion has an average life span of 14 years and Juboraj is already 18. We brought him from the Chittagong Zoo eighteen years back. Many countries in the world have a policy to euthanise ageing zoo animals to relieve those of the sufferings, but Bangladesh is yet to have such law. We came to know about the ailing lion quite a few months back. We have no way but to let the lion live, wherever the sufferings might be. Bangladesh doesn’t have a euthansia or painless killing act. The best we can do for the lion is create a medical board and keep it under special care in the Central Veterinary Hospital at Alauddin Road. I have no objection in killing the captive animal in such a condition, but there are people whose sentiment can go against it. So the best way is to isolate it. Moreover, the sick lion may have been suffering from different contagious diseases? The isolation can prevent the spread of those diseases among the other zoo animals. Let’s hope Juboraj gets the help he needs as soon as possible! No animal deserves to suffer like this. 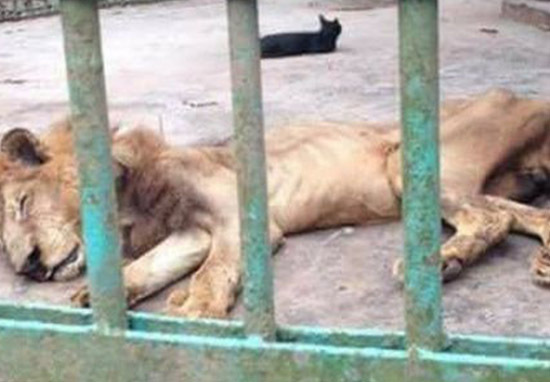 Abdul Hamid president of Bangladesh: Lion is starving to death in Comilla zoo, Bangladesh.